Liam’s Map Wins Woodward Stakes In Tour de Force: Denied victory in the Grade 1 Whitney earlier in the meet, Liam’s Map didn’t let another Grade 1 win slip away on Saturday at Saratoga Race Course. 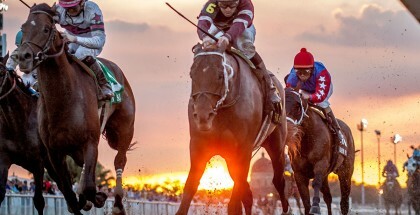 The 4-year-old colt took command of the $600,000 Woodward at the start, dictated a moderate pace, and rolled home in the stretch to complete the 1 1/8 miles in a sparkling 1:47.44. The win was redemption for Liam’s Map after a heroic effort in the $1.25 million Whitney on August 8 at the Spa. The son of Unbridled’s Song set a wicked pace in the Whitney and opened up by nearly five lengths in the stretch before he was picked off in the waning strides by multiple Grade 1 winner Honor Code. On Saturday, no horse was within 4 ¾ lengths of him at the finish. Breaking from post 2 in the Woodward, Liam’s Map shot to the front under Javier Castellano and waltzed around the first turn, clocking the opening quarter-mile in 23.69 seconds, with the speedy Bay of Plenty stalking the pace in second and the Pletcher-trained Coach Inge in third. 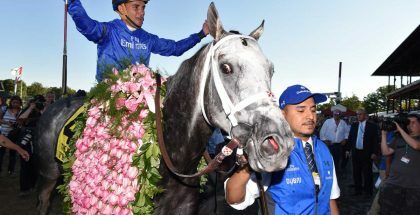 Liam’s Map continued to cruise along down the backstretch, going a half-mile in 47.49 seconds and three-quarters in 1:10.94, and the gray colt promptly shrugged off his two pursuers leaving the far turn. 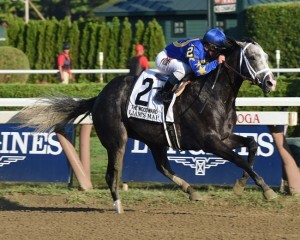 Spurred on by Castellano, Liam’s Map readily extended his advantage down the stretch and went on to a facile victory. As the 6-5 favorite, Liam’s Map returned $4.40 on a $2 win bet and increased his earnings to $808,940 for Teresa Viola Racing Stables. Castellano, who rode Honor Code in the Whitney, picked up his fifth Grade 1 victory of the meet. Currently second in the jockey standings, Castellano also scored aboard long-shot Keen Ice in his upset victory over Triple Crown winner American Pharoah in the $1.6 million Travers. 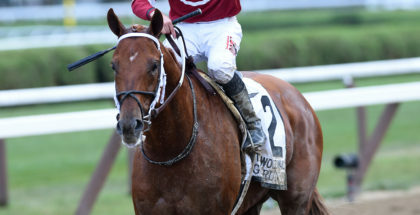 Making his first start since a courageous effort in the Grade 2 Suburban Handicap on July 4 at Belmont Park, Coach Inge stayed on for second and gave Pletcher a 1-2 finish in the race. Two horses from the barn of trainer Jimmy Jerkens rounded out the superfecta, with last year’s Grade 2 Jim Dandy winner Wicked Strong finishing third and Effinex a neck behind. The Pletcher-trained Mylute checked in fifth, followed by Bay of Plenty, Commanding Curve and Pletcher’s fourth runner, Protonico.